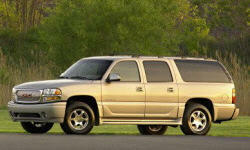 GMC Yukon Pros and Cons | Page 1 of 1 | Why Not This Car? What drives people to buy (or not buy) a certain car? 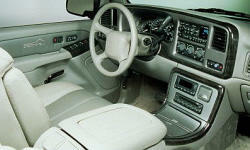 TrueDelta's members share GMC Yukon pros and cons based on their real-world driving experiences. Using the 02-06 Tahoe/Yukon for towing, a good idea? Great, durable powerful vehicle that can be used for luxury travelling or towing duties. Being a 2001, the electronics lag behind offerings in new vehicles but also far less things to break. Had a 1999 and a 2003. Excellent experience with both of those and so far the 2010 has been great. Perfect for our four older kids and dogs. This SUV is absolutely divine. The cabin insulation dampens all road noise you might here. The Yukon Denali has a very nice classic design that still looks good even after 7+ years of being on the road. It stands out just enough to make you love it, but not enough to have any "questionable" design cues. High seat position makes it easier to see beyond all edges of the vehicle. This makes it deceptively easy to park and maneuver. Light, communicative steering feel, feels like it can go over anything.